Lancaster Mennonite provides artistic skills, appreciation and opportunities that nourish creativity and a deeper understanding of God and the world. 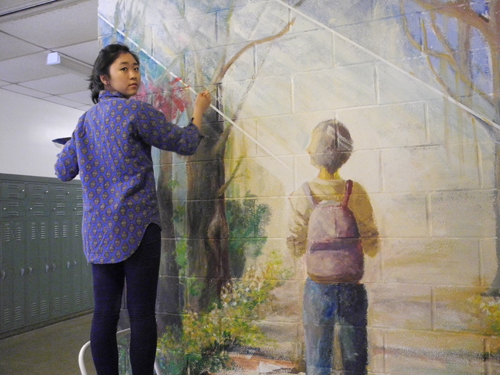 At all levels, art is integral to an LM education. Our students exercise their artistic, dramatic, and musical creativity in spaces designed to nurture and facilitate high-quality artistic expression. Lancaster Mennonite High School holds an established reputation for excellence in choral music, features an award-winning drama program and regularly has many students winning local, regional and national art awards. The Calvin and Janet High Fine Arts Center on the Lancaster Campus physically represents our deep commitment to the role of the arts in a holistic, excellent education. 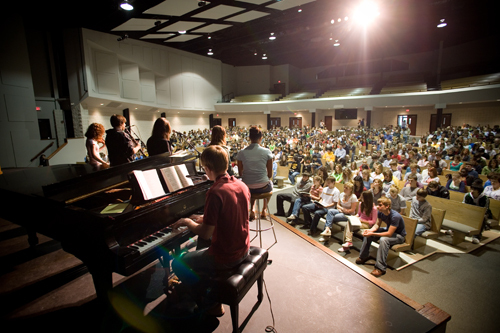 The Fine Arts Center contains a state-of-the art 1,300-seat auditorium, music practice rooms and art studios. When rock star Conrad Birdie receives his draft notice, his fans are devastated, but none more than struggling songwriter Albert Peterson, who is also Conrad’s manager. Albert’s longtime girlfriend, Rosie, comes up with the idea to write a new tune called “One Last Kiss” that Birdie will perform on live television and give that one last kiss to one of his randomly selected fans. The scheme works, with young Ohio teenager Kim McAfee set to be the recipient of conrad’s kiss, but no one has counted on the jealous wrath of her boyfriends. The television show veers way off course and the town is sent into turmoil. 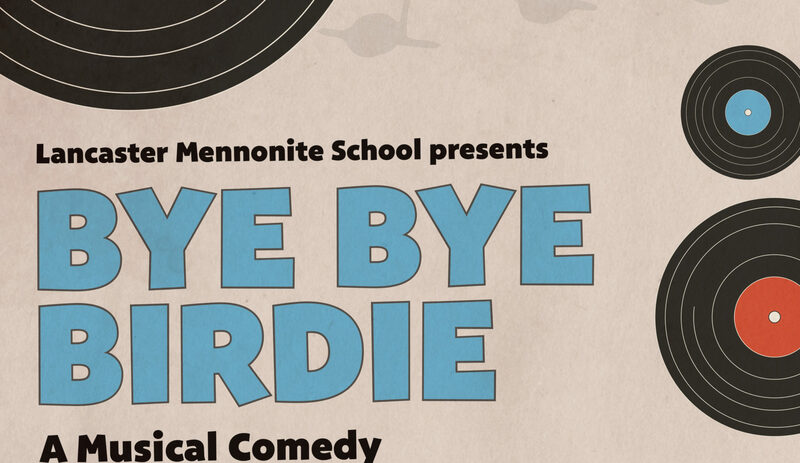 Don’t miss this fun-loving musical, a tribute to the 1950’s and the winner of the 1961 Tony award for best musical. Tickets can be purchased online by clicking on the PURCHASE tab below. LMH art courses cultivate reflection and aesthetic sensitivity to cultural expressions worldwide. An awareness and appreciation for all of God’s earth and people leads to constructive creativity. At the high school, twelve art courses are offered, including sculpture, drawing, painting, ceramics, design, photography and digital photography. Explore all of the options for art classes at our full curriculum guide below. LMH provides students with on-stage drama/theatre opportunities that cultivate and showcase creativity and self-expression while challenging them to a deeper understanding of people and issues. 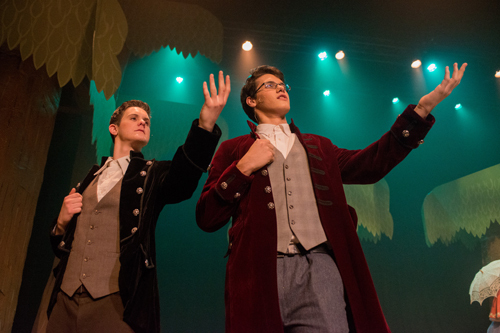 LMH students have the opportunity to participate in two dramatic productions each year, one of which is a major musical. LMMS students have the opportunity to participate in some LMH productions and also have their own middle school production. The LMH drama program is committed to authentic story telling. . . At times, truthful storytelling requires the portrayal of attitudes and actions that are contrary to our understanding of God’s desire for us. Our belief is that the story challenges us to think critically and wrestle with life and human brokenness. Engaging in this challenge strengthens our ability to serve the world as God’s instruments of healing and hope. Students have the opportunity to participate in several vocal groups and take voice instruction. The school’s auditioned select choir, the Campus Chorale, has an established reputation for excellence, and many Chorale members win local, regional and state awards. LMH offers performance opportunities with String Orchestra, Concert Band and Jazz Ensemble. Piano and guitar classes are available as part of the music curriculum. Especially gifted students can participate in the Advanced Music Studio at the Lancaster Campus. Sixth grade has a general music class throughout the school year and may also elect to be in one of the performing groups: Concert Band, String Ensemble or Choir ($20 music fee for choir). Seventh-grade students who are not part of the performing ensembles are required to be in a general music class. Eighth-grade students may elect to take music classes.